CHILDREN: a son Dylan, who was born on April 2, 2002, and a daughter Ella, who was born on December 18, 2007. Michael Muhney was born in Chicago, IL but moved with his family to Euless, TX when he was 8. After graduating from Trinity High School, he returned to Chicago, where he attended the Goodman School of Drama (now known as The Theatre School) at DePaul University. After college, Muhney landed roles on the TV series TURKS and REAL LIFE. Throughout the early 2000s, he earned steady work as a prime-time guest star, appearing on series such as E.R., WITHOUT A TRACE, JAG and CHARMED. Meantime, he was a regular on THE HUNTRESS from 2000-01 and was in the movies Love 101 and Nicolas. In 2004, he made waves as shady, snarky Sheriff Lamb on The WB/CW’s cult hit VERONICA MARS. Fans were shocked and devastated when his character was killed off in 2007. 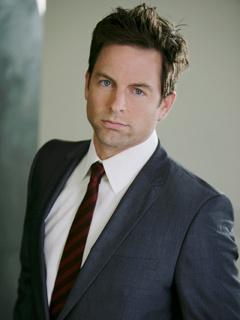 After his VM stint ended, Muhney starred in several indie films including Act Your Age, No Man’s Land and The Portal. Then in June, 2009, YOUNG AND RESTLESS suddenly had to recast the character Adam Wilson when portrayer Chris Engen abruptly quit the soap. On June 25, Muhney readily stepped in as Victor’s scheming scion and picked up right where Engen left off. Within days of being on air, Muhney’s Adam seduced Rafe, lied to Heather and Victor, continued to gaslight Ashley and plotted with Mary Jane. Talk about baptism by fire! His official Web site is www.michaelmuhney.com. Speaks German and American Sign Language. Was up for the role of J.D. on SCRUBS, but lost it to Zach Braff. Was awarded the Arhur J. Schmitt Scholarship for college. Michael Muhney suffered a concussion and some nasty cuts and scrapes when he was in an accident in a bike race on April 9. According to his Twitter page, Michael Muhney, who was let go from his role of Y&R’s Adam last year, is optimistic about his professional career. MICHAEL MUHNEY: "I WILL NOT BE RETURNING TO Y&R"
On Twitter, Michael Muhney (ex-Adam) revealed that he won't be back in Genoa City. During the recent Television Critics Association Winter Press Tour, Nina Tassler, President, CBS Entertainment, was asked about the termination of Y&R's Michael Muhney (Adam). ERIC BRAEDEN ON MICHAEL MUHNEY: "HE WANTED ME OFF THE SHOW." Y&R superstar Eric Braeden (Victor) weighed in on the Michael Muhney (Adam) controversy exclusively to Radar Online. After Michael Muhney (Adam, Y&R) tweeted that he was fired on December 17, he's been quiet on Twitter.